Are you looking for a place that treats you with a opulent menu, unprecedented deserts and a miscellany of cocktails and mocktails along with games like bowling and foosball with relaxation offered by a spa massage? PVR bluO at Ambience Mall, Gurgaon is the right place providing you with a perfect setting for get-together, quality family time or an unofficial business meeting. DU Beat team recently visited their premise. The team enjoyed a hearty meal, a terrific bowling set, engaging video gaming trials, relaxing Spa sessions and much more. Our correspondents – Ishaan Gambhir, Iresh Gupta, Ishani Rajkhowa and Ishaan Sengupta share their experiences at PVR bluO! BluO offers a wide variety of alcoholic beverages along with a few regular non-alcoholic ones like ice-tea, aerated drinks and the mocktails with which we, the DUB team, started our tasting expedition. The drinks were a combination of innovation and flavour which were refreshing for our taste buds. The star of the lot was certainly “Sunday Morning” with its sudden bursts of sweetness and the right balance of mango. Trailing just behind was “Alaska Apple” which was quite unique for an apple drink. Do not judge it by the look though, behind the questionable appearance is a taste that will surely appeal to the taste buds. The vegetarian appetizers ranged from Paneer tikkas (Chef’s recommendation) to Sandwiches and Chilli Paneer. The Garlic Bread basket contained four different types of toppings – Mushrooms, Tomato, Corns and Zucchini while the tikkas were quite savoury too. However, the plating itself takes the cake! The average price of the vegetarian appetisers’ section is Rs.249, the cheapest constituent being Quesadillas for Rs.199. Fish fingers, the beer battered golden fried fish served on the bed on french fries took a back seat here as they didn’t complement the dip it was served with. The quality of fish and the way it was cooked forced us not to leave behind anything on the serving plate, but for a Rs.399 dish, we were’t satisfied. A standard non-vegetarian appetiser can be ordered here for Rs.349, fish appetisers naturally being the most pricey ones. Welcome starters at Blu-O were accompanied by the vehement eagerness to bowl at India’s renowned bowling alley. Right after the chef’s savories, we moved towards the alley area to have a game of bowling. Accompanied by the right kind of music, bowling at Blu-o was the right activity to rejuvenate. With assisting staff and trainers right by the side of fresh bowlers and food delivered right at your bowling tables, Blu-O ensures its guests have a great time. Our team also ordered the main course food at the bowling tables, which we enjoyed partially with the game of bowling and then watching the ongoing T-20 matches. With the live screening of the ongoing games on AV screens, the ambience of the venue suits perfect to host all kinds of get together parties. However, the music collection may not suit the small number of people who just come to dine in at Blu-O as the peppy music just synchronizes well with the mood of gaming. Apart from the 24 bowling alleys, Blu-O also offers Foosball gaming, Dart games, Air Hockey and Snooker, which makes it an ideal destination to de-stress and bond. You must be hungry again! For the main course, we decided to take the Italian route with Veg Alfredo White Sauce Pasta flavoured with Parmesan Cheese and 3 Cheese Pizza along with tasting the Chinese flavour of Honey Chilli Potatoes, the honey and chilli proportions of which can be customized. BluO’s main course dishes are cheaper than its appetisers – the spread costed us Rs.1100, which in our opinion is reasonable. The food was satisfactory and the servings pretty generous as compared to other high-profile restaurants. The triple decker Chicken Classic Club Sandwich, again served with French Fries, was also our perfect companion at the bowling alley table when we were waiting for our respective turns. What made the dishes stand out was the beautiful presentation of the food. Portions were liberal. 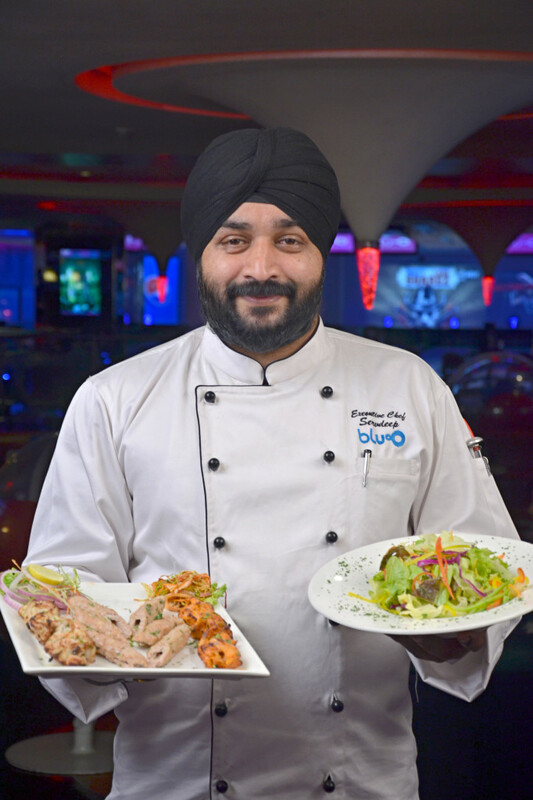 Expect Servdeep Singh Malhotra, Executive Chef at PVR bluO, Gurgaon, to drop by at your table and ask for your opinion as well as help you choose your spread. The celebrity chef has been associated with Masterchef India and has an experience of 14 years. Chef Servdeep, on discovering us clueless about our choice of dessert, presented us with fried Mexican Churros with chocolate sauce. Churros is not a difficult dish to make, thus our focus was on the little efforts that go into cooking it and to our delight, we realized the little efforts had been emphasized on. The Churros were perfectly shaped and the amount of cinnamon and caster sugar was well balanced. After a lot that bluO offered us, we were really looking forward to try out the Spa. With no sound audible from the sold out crowd outside, the Spa Room was completely serene. Dimly lit with candles around, the place has a calm aura. The masseurs seemed exceptionally skilled in their ‘art’ of neck and back massage that we opted for. The room was well equipped with the customized seats for different kind of massage and hygiene was of top priority. Looking for a personalized area? The premise also accommodates recently added Play Station Lounge in collaboration with Sony where one can experience latest games in the most suitable environment with closed space. The lounge also witnesses launch of new games which attracts a lot of crowd. With its high premium private areas, Platinum Lounge serves its special customers at Blu-O by providing spaces separate from the crowd with comfortable couches which signifies embodiment of luxury. Unlike other karaoke’s in Delhi, bluO offers a strictly sound-proof room and has a variety of sound tracks to offer ranging from Bollywood to western rock music. The spacious seats inside the room can accommodate up to eight people. The microphone and the sound system is of premium quality and the television provided us with lyrics in high definition. There is also an option of receiving food orders inside the karaoke room. We jammed to some Backstreet Boys while we munched on spicy potatoes with honey.